Part 1 of this entry was posted Wednesday, June 3, 2009; Part 2 on June 7, 2009. As you study the twelve dispute domains, you will perceive it more desirable to be located as near to the bottom left corner as possible, especially when certain priorities are taken into account. * The more positive features of the locations down and to the left are not available disputes move up or to the right, due in part to the properties of each domain in relation to certain "quotients" of conflict interaction. The properties of each of the twelve dispute domains vary according to at least six conflict interaction quotients: (1) forbearance (2) personalization; (3) empathy; (4) mutuality; (5) outcomes; and (6) future relationship. The forbearance quotient describes the degree to which conflict parties are willing to forbear one another their differences. The differences that exist might be deemed not significant enough to do something about them; although, to be plotted on this model, the differences have to be significant enough for one of the parties to be motivated to bring up the matter to his brother spontaneously (the lowest and most left of the domains). Moving up or to the right anywhere on the chart of dispute domains diminishes the forbearance quotient. For example, I am suggesting there is greater forbearance associated with brother/planned communication than with neighbor/planned communication. 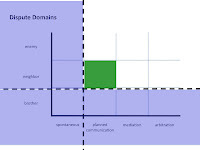 Stated more generally in terms of an hypothesis for proposed research, each dispute domain will score higher on a forbearance scale than other domains above it or to its right. On a practical level, this means there is value in recognizing that forbearance plays a role in locating a particular dispute in a particular dispute domain. Re-locating to another domain lower and/or to the left might be possible simply by one of the parties choosing to forbear his counterpart on the issue at hand. Or re-location might also be possible by choosing to forbear on some of the issues at hand, simplifying resolution for remaining issues. In Ephesians 4:2 and Colossians 3:13, the Apostle Paul exhorts us to forbear one another. The idea is to patiently bear with one another. Forbearing is something we do quite naturally with people we love. The remarkable feature of Ephesians 4:2 and Colossians 3:13 is that Paul exhorts it, meaning forbearance is something we can choose when it does not occur naturally. Such a choice, in turn, stands to improve where we locate any particular conflict we might be party to. For more on deciding when to forbear, see pp. 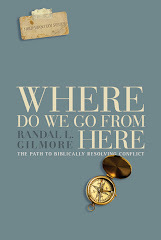 23-24 of Where Do We Go From Here: The Path To Biblically Resolving Conflict. Think of a conflict you were involved in recently. How might things have turned out differently had you or the other party practiced biblical forbearance? *See When the Play's in the Wrong Theater by Gail Miller and Robert Dingwall in The Negotiator's Fieldbook, edited by Andrea Kupfer Schnieder and Christopher Honeyman.